Nemanja Bjelica produced another double-double to lead Fenerbahce Ulker Istanbul to a tough 91-90 victory over Laboral Kutxa Vitoria at Ulker Sports Arena in Istanbul. Bjelica scored the go-ahead free throws with 13 seconds left and corralled the final rebound to secure the victory, which lifted his team to its third straight victory, improved its record to 4-2 and kept it in third place in Top 16 Group F. Laboral dropped to 2-4. 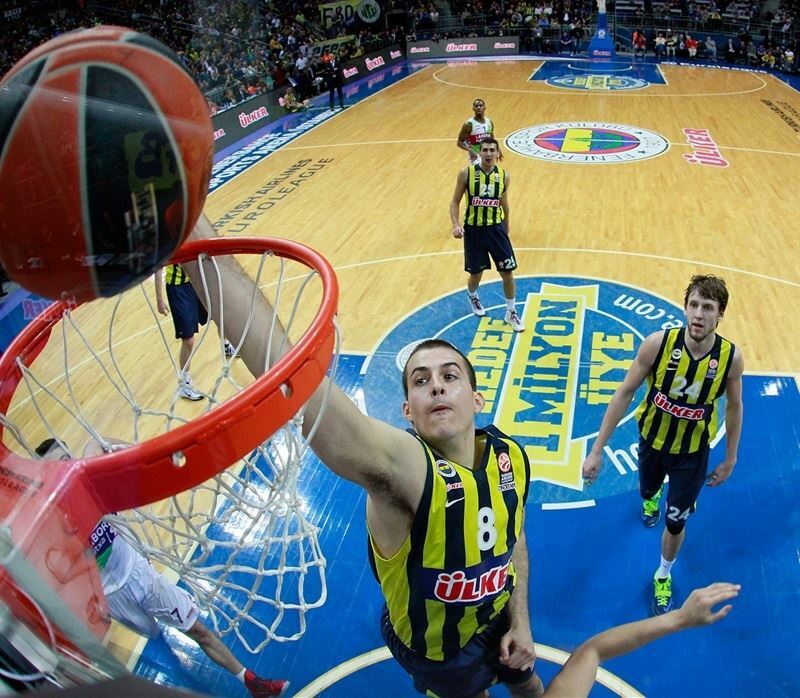 Bjelica finished with 14 points, 15 rebounds and 2 blocks for the Turkish champs. After a close first half, Jan Vesely and Emir Preldzic highlighted an 18-3 third-quarter run that put the hosts up 15, but Laboral fought back. The visitors clawed their way back to take the lead on Mike James’s free throws in the final minute. And after Bjelica’s free throws, Laboral had 2 shots to win it, but James and Davis Bertans both missed. 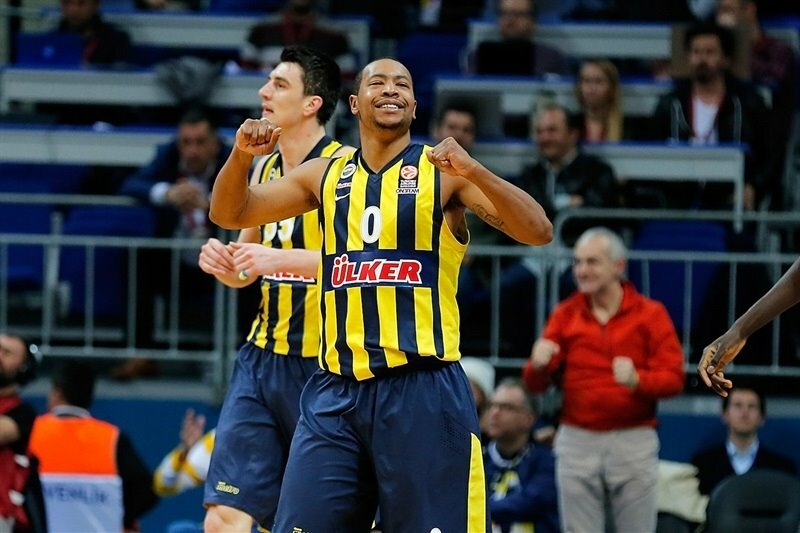 Andrew Goudelock led the winners with 19 points, Emir Preldzic scored 13, Jan Vesely 12 and Bogdan Bogdanovic 11. Fernando San Emeterio paced Laboral with 15 points, James and Davis Bertans scored 14 apiece, Toko Shengelia added 11 and Darius Adams tallied 10 points and 6 assists. Colton Iverson got the visitors on the scoreboard first before Bogdanovic drilled a three-pointer. The hosts made an early substitution after starting center Semih Erden committed a pair of fouls in the first two minutes. Bogdanovic drove for a layup, but Kim Tillie’s three from the corner made it 5-7. After Oguz Savas rejected Adams, Nikos Zisis tied the game on the break. Threes by Bertans and Ben Hansbrough kept the visitors rolling, though Zisis and Bljelica kept Fenerbahce within 11-13 at the first TV timeout. Bertans drained another three and Bjelica scored again inside. Adams joined the shootout with Laboral’s fifth triple. Savas made his presence felt with a put back and a bucket in the paint. James darted through the hosts’ defense for a layup, but Goudelock’s first points came on a three-pointer that ended the quarter at 20-21. San Emeterio and Mirza Begic kept Laboral going with baskets in the paint. Goudelock got a floater to drop and then drilled a three to tie the game at 25-25. Shengelia’s free throws put the visitors back ahead briefly before Goudelock hit another jumper. 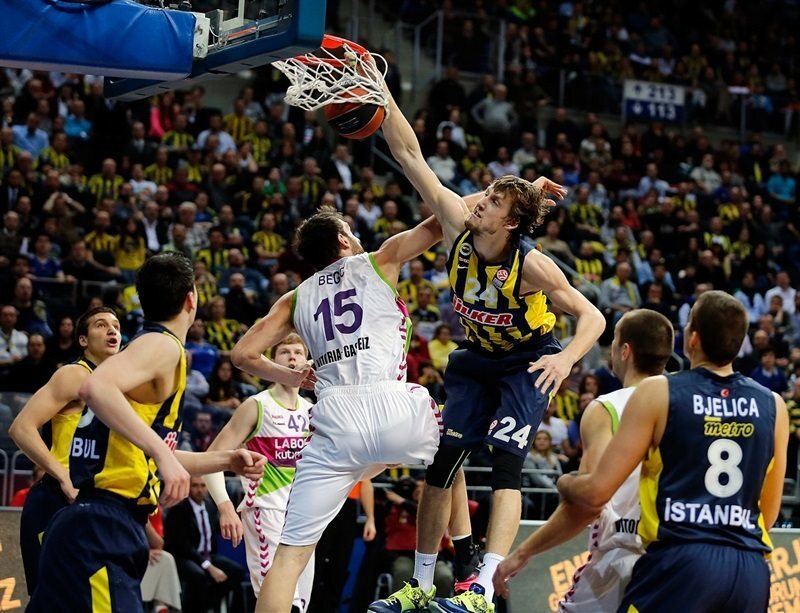 Vesely sank free throws to put Fenerbahce in front, 29-27. The lead switched hands again as James scored from downtown and Goudelock added a jumper. After a timeout, James hit another shot and Kenan Sipahi scored in transition. Shengelia scored on the offensive glass and then a basket-plus-foul from a dish from James to tie the score at 37-37. Preldzic’s layup gave the hosts a 3-point edge. Shengelia drive and a San Emeterio layup put the visitors ahead 40-41. Preldzic used his speed to drive for another layup and San Emeterio countered with a finger roll. Goudelock nailed a three from the corner to end the half at 45-43. The score was tied again after Hansbrough’s layup to start the second half. Vesely heated up with a three-point play before throwing down a ferocious slam. Vesely also collected a pair of rebounds before Preldzic nailed a three to ignite the crowd. 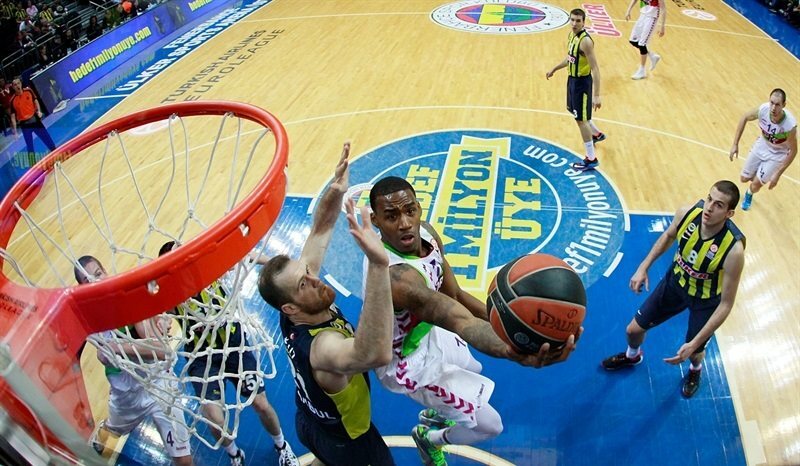 A timeout changed little as Preldzic’s layup gave Fenerbahce the game’s first double-digit advantage, 55-45. San Emeterio canned a three to end the Laboral drought, but Vesely, who missed on an alley-oop, grabbed his rebound, scored and was fouled. Bjelica extended the difference to 11. 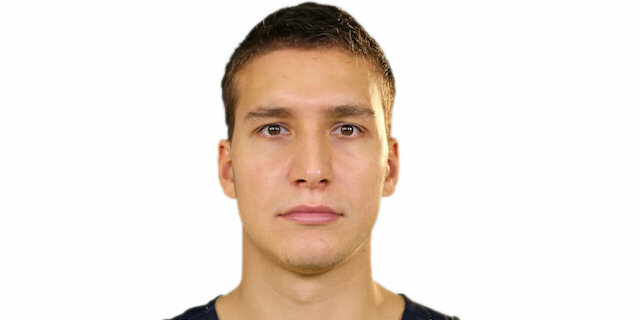 Then Bogdanovic scored twice and contributed a pretty block of San Emeterio for a 63-48 lead midway through the quarter. Iverson beat the 24-second clock with a layup and after a Goudelock layup, Adams drilled a three-pointer. Bjelica free throws were matched by Iverson’s dunk. San Emeterio sank a three to close the gap to 9. Shengelia muscled his way to another score and San Emeterio silenced the arena with a deep three that made it 67-63. Bogdanovic’s pull-up jumper was matched by Begic’s free throws. Kenan Sipahi made it 71-65 from the line. Bjelica shined with an assist to Luka Zoric at one end and a block on the other. James and Adams each scored to bring the visitors within 4. Preldzic countered with a foul-line jumper. Bertans ended his shooting slump with a triple to make it 77-76. Bjelica attacked the rim for a two-handed slam and Zisis managed to avoid Begic for a layup and a 5-point cushion. Bertans fed Iverson for a slam, but Goudelock found Zoric for a basket-plus-foul and an 84-78 lead, Bertans sank his fourth three-pointer to make it a one-possession game with four minutes remaining. Goudelock drove the baseline for a tough layup. Tillie sank a jumper at the other end. Preldzic snuck a pass through to Vesely who threw down a wicked dunk. Tillie’s free throws kept it close with two minutes to go. Zisis and James each split free throws. Tillie poked the ball away from Bjelica and sent it to James for a slam to make it 89-88 with 58 seconds remaining. The Laboral guard gave his team its first lead of the second half with 2 free throws. Bogdanovic drove and missed, but Bjelica drew a foul on the rebound and with 13 seconds on the clock, hit the 2 free throws for a 91-90 Fenerbahce lead. Laboral called timeout and wound up with shots for James and Bertans to take the lead, but both missed and Bjelica corralled his 15th rebound to secure the victory. "The game was very important for us. We tried to be at the level how we played lately, first of all defensively. So it was easy to recognize we had problems defensively. We played a lot of one-to-one. They are a team that often tries to find a first option. We talked in halftime about changing defense, and I think at one period we played excellent. 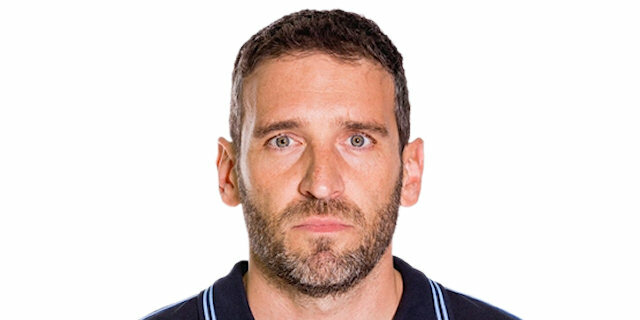 This is Euroleague, and Laboral Kutxa plays the same regardless of being up or down. And they came back. It would still be easy to finish the game, but turnovers almost decided the game. Just one steal and 12 turnovers is too much, and if you do this in the crucial moment of the game, you have a problem. Finally, they had two shots and they did not score. I don't know if it is because of our good defense or they were unlucky, but we won the game. The victory is really important for us, and I want to thank the fans for great support once again." "First of all, it's really sad to lose the game in the last second against a strong team like Fenerbahce Ulker. I think we played really good and smart. We came back from 15 points behind but the shot selections that we made in crunch time were not right. I really want to say once again that I'm very sorry for losing this very close game at the end." "We had some ups and downs during the game. When we had a 15-point lead in the middle of the third quarter, I think we thought that we had won the game. But that is a mistake. 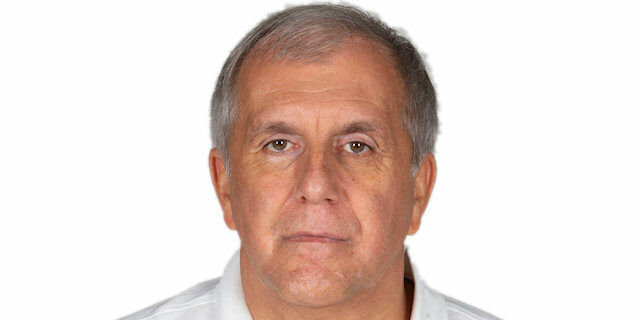 There's no such thing, no Euroleague team will let you go easily until the end. Laboral Kutxa also played really well to come back. But the luck was on our side at the end."